OK, we're almost at the end of October, but in my book every month is adopt a shelter dog, October simply being the official one. 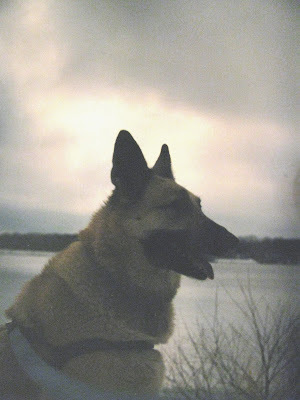 I've almost always had a breed , mainly German Shepherd obviously, but there were some others. But from childhood I think all have been shelter or rescue with 2 exceptions. All were amazing dogs . My point here is purebreds can be found at shelters, something I have to tell many people. They ask me about a dog , then say well we want breed A. Countless times I've explained shelter and rescues and this started long, long before "rescue" became a popular term or pet to have. The shelter I volunteered at , small town it is, has had St. Bernards, Great Danes, even a Borzoi once. The bigger the area , the more you'll find. But remember every dog is beautiful and needs a ( good) home. Loving all dogs as I do, I can't say enough for a mixed breed as well. Less genetic disorders depending on what breed you're going for and the cuteness level never drops. A dog is a wonderful thing, period. So support your local shelters and if you or someone you know is looking for a dog, check them . And ask them if you need more help. My Max seen here was a shelter pet, and no one ever believed me. Shasta is a rescue and people assume I paid hundreds of dollars. What's true is that both are priceless. Two girls, one a German Shepherd, who have many similarities.